This article was originally published on the KIPP Nashville blog. Two months ago, I began a new chapter in my life as a freshman at the University of Tennessee in Knoxville. It was surreal walking into my first class hundreds of miles away from home and worlds away from my life just a year earlier. A year earlier, I was beginning my senior year at KIPP Nashville Collegiate High School and trying to adjust to life without my Mom. When my Mom passed away, it turned everything upside down. This is a story about how I made it to my first day of class at the UTK and how I would not be where I am today if it weren’t for the KIPP Through College team. When my Mom passed away, I basically gave up on the college application process, even after working so hard for the past few years. At the time, it felt like too much to overcome, and I didn’t want to be far away from my 11-year-old brother. Our KTC Director, Ms. Russ, essentially became my second Mom throughout the college process. She became a lifeline, someone I could call or text any time of day, whether it was about school stuff or just because I needed someone to talk to. 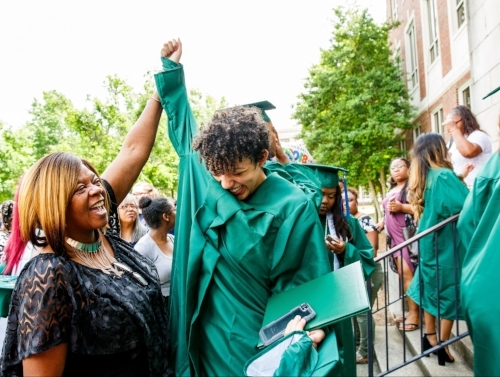 When I wanted to give up, Ms. Russ helped me revise my college list to apply to new options closer to home and made sure I completed the necessary financial aid paperwork. When I was overwhelmed by which option to choose in the spring, Ms. Russ helped me analyze everything so I could make an informed decision. For me, that was UTK. When I officially accepted, I thought that was the end, because for most students, it is. Not for me. My FAFSA was flagged for verification. If you don’t know what I’m talking about, then trust me when I say this process makes going to the DMV look like a walk in the park. You basically have to prove to the federal government the information on your FAFSA is accurate. If you don’t produce all the documents in time, you won’t get access to the financial aid money you earned – instead, you risk being purged from the school’s system completely or having to pay out of pocket. It sounds scary, because it is, especially to a first-generation college student, like me. For months over the spring and summer, the requests for document verification kept coming and I had no idea where to find most of the documents they requested. So there we were, Ms. Russ and I, scanning and faxing document after document to the financial aid office. Each day without that money, I became more and more uncertain on whether I would be able to go to college. It honestly seemed much simpler to stay home with my little brother and work. Once again, Ms. Russ wouldn’t let me quit. She followed up with me and the financial aid office weekly over the summer and I’m happy to report my financial aid money was finally released. I’m now able to walk around campus with a huge weight lifted off my shoulders, able to focus on my goal of becoming an accountant. While I’m glad to be at UTK, it wasn’t an easy road to get here, and I can say with certainty that I would not have made it to college without the love and support I received from the KIPP Through College team. Our Collegiate teachers told us every day it’s the journey to and through college that we’re working toward, and I plan on fulfilling my end of the bargain by getting my degree. I know my Mom is looking after me every step of the way. A program of the Tennessee Charter School Center. Photography submitted by member schools.